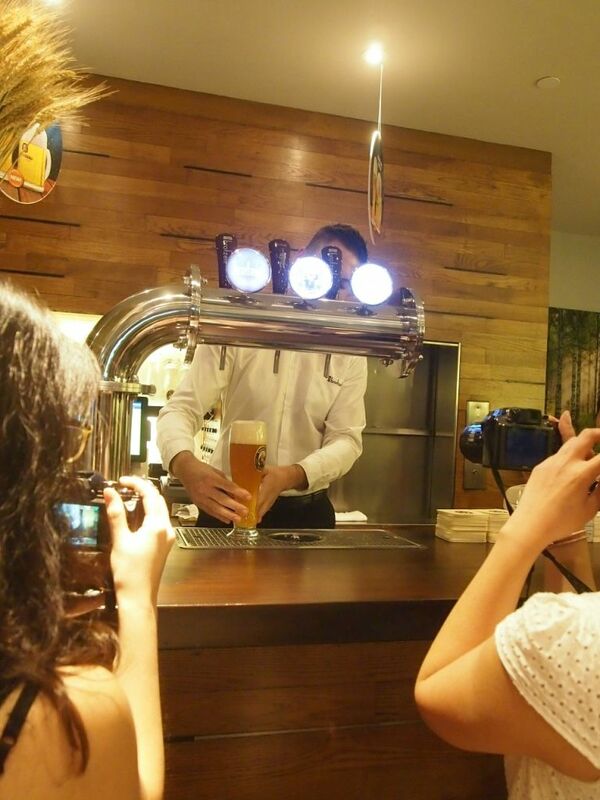 The Löwenbräu Original Münchner Lager, Franziskaner Hefe Weissbier, Franziskaner Dunkel Hefe Weissbier and Löwenbräu Original Münchner Dunkel Lager are available in Singapore for the first time and exclusively at all Brotzeit outlets. The beers are brewed adhering to the respected German Beer Purity Law so diners can be sure that what they are getting at Brotzeit is top quality German beer. To be absolutely honest, I don't like beer. But the beers at Brotzeit have changed my mind. I actually enjoyed all four, and I would have finished them if I wasn't so stuffed already. But for me to have downed 2.5 glasses out of 4, it certainly says alot about their beers! White asparagus is in season now and Brotzeit flies them in regularly. 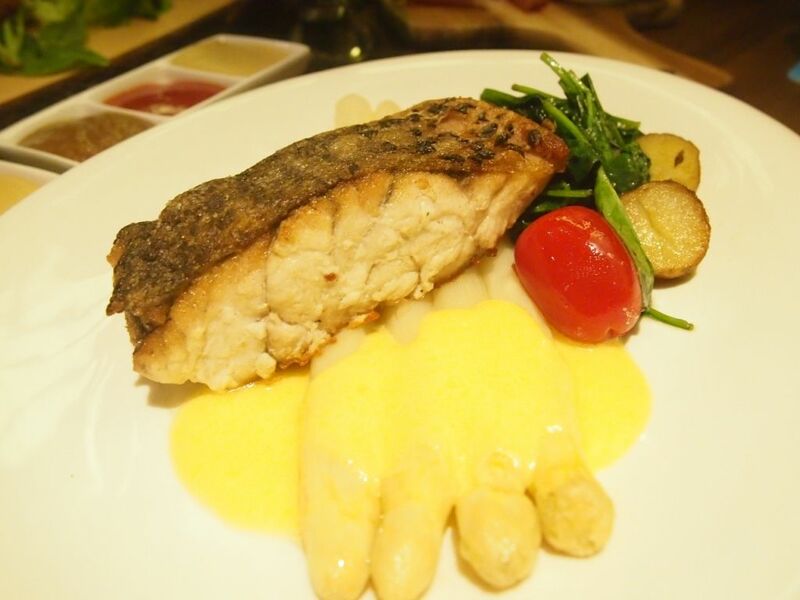 If you're a huge fan of white asparagus, you know where to go! The crispy Roasted Pork Knuckle is marinated with beer and takes 48 hours of preparation to achieve its final state of a juicy and tender core wrapped up in an incredibly crispy exterior. We were told that some diners order this dish just for the crackling! 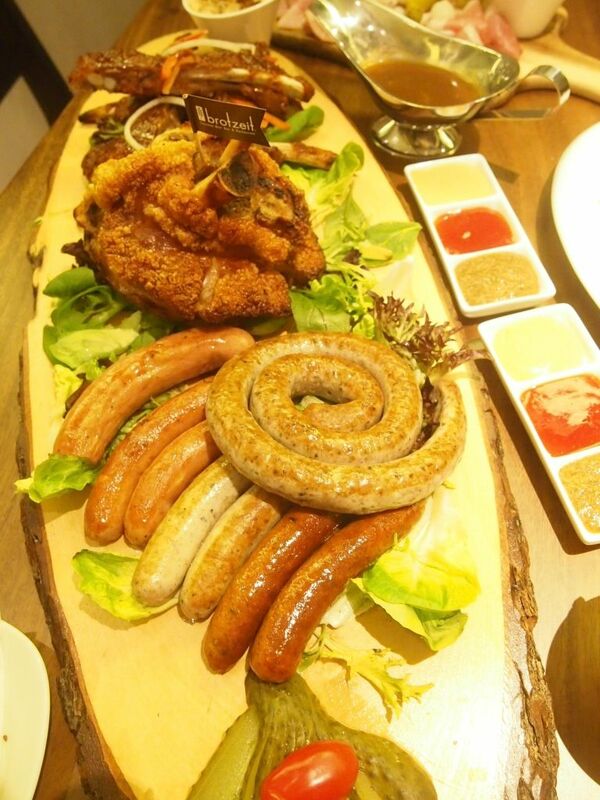 To ensure that the taste of the sausages is authentic, the spices used in the production of sausages are blended in Germany before the sausages are crafted locally by a German butcher. Of the assortment of sausages, I found the Snail Sausage most appetizing. 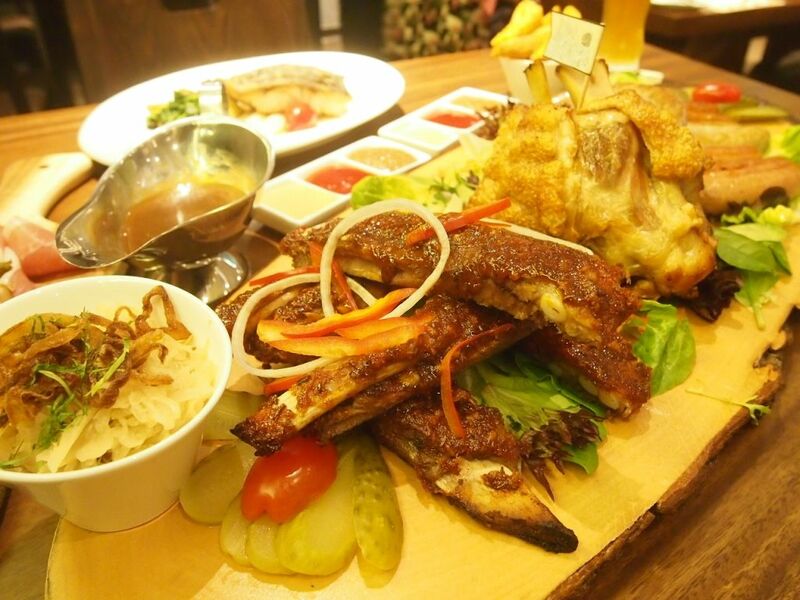 The Honey Bavarian Pork Ribs is sweet but has quite a strong and sharp spicy edge to it. While most enjoyed it, I personally did not fancy the ribs because of the spiciness. Diners can choose two sides to go along with their platter and we were recommended the Sauerkraut and Wedges. 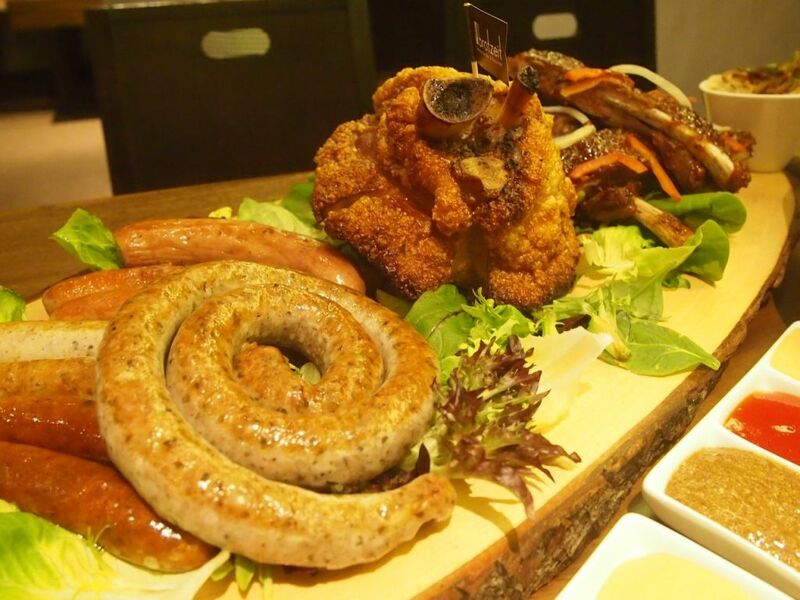 The platter is enormous and feeds four to five comfortably. 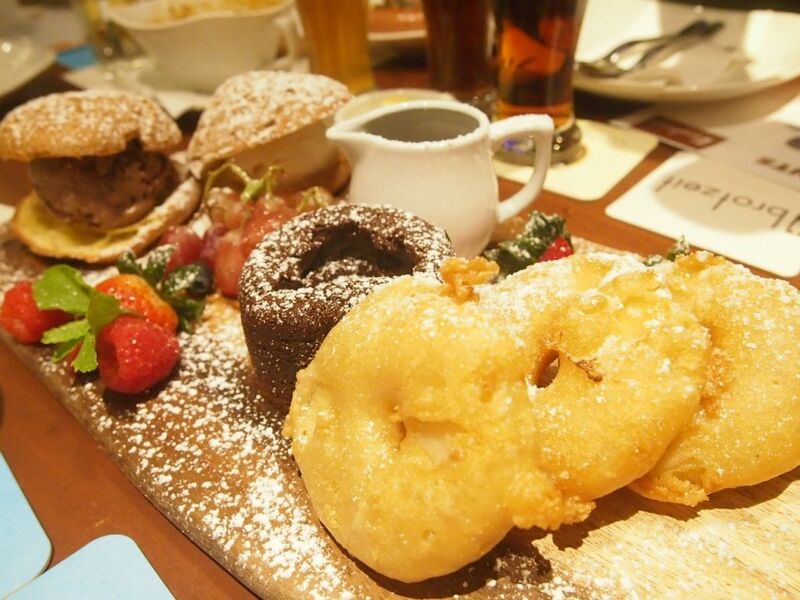 Beer battered apple slices, profiteroles with vanilla and chocolate ice cream, warm chocolate cake, fresh berries and grapes arranged in a pretty fashion on a wooden board. Where do I begin? I attacked the warm chocolate cake first and was pleasantly surprised by how satisfying it was. The molten chocolate was rich and the cake was moist and soft. Not chocolatey enough for you? Don't be shy, pour the accompanying chocolate sauce over if you'll like! The apple rings and profiteroles were pretty decent but the highlight for me was quite obviously the chocolate cake. This is the first time that I'm dining at Brotzeit and it definitely won't be the last. I'm glad to be introduced to beers that I actually like!